Yup, we’re all just filthy scum…Now go have a happy “cross-centered” day! 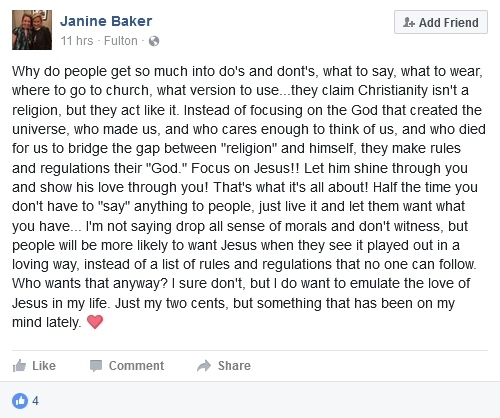 Focusing on sin is all the rage among “christians” today. Is it any wonder? 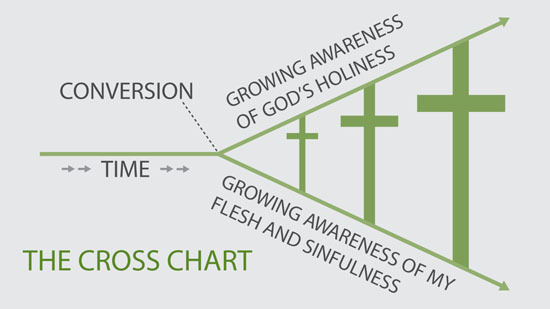 The “cross-centered” orthodoxy teaches that the more one gains a deeper understanding of their sinfulness, the more they gain a greater understanding of God’s holiness and a realization of what a great price was paid for their salvation, making the cross bigger. So are you bothered by the realization that you continue to screw up in life? Well, you should be. After all, you are just a dirty, rotten, totally depraved sinner. 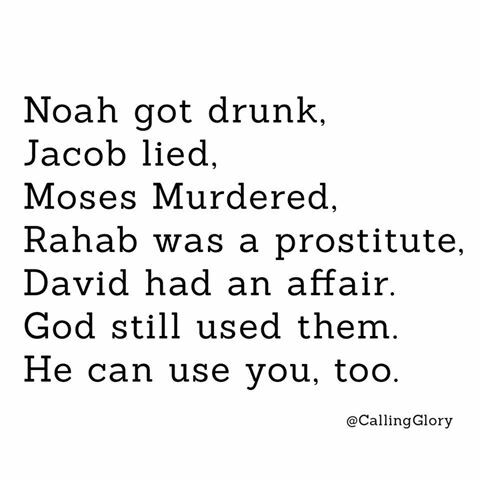 But don’t worry, the Bible is full of dirty, rotten, totally depraved sinners, and it worked out for them just fine! That should make us feel better right? Yet the number of “christians” who lack assurance of their salvation is pandemic. However, the problem is not that “christians” don’t focus enough on their sin. The problem is not that they are not living “cross-centered” lives enough. In fact, such behavior is only going to exacerbate the problem. Constant introspection on sin only produces fear. Most christians’ lives are characterized by a fear of whether or not they are living “cross-centered” at any given moment. Rather than showing love to God and others by aggressivly pursuing obedience as the Bible commands, they are paralyzed in their continual self-enslavement to sin. Protestants like to go around saying “Man has a sin problem”. My counter to that is, no, the problem is not man’s sin, the problem is his realtionship to the law! But for the person who is born again, the law can no longer condemn (Romans 8:1) because the old man has been put death (you cannont condemn a dead man). In his place is a new creature who is the literal righteous offspring of the Father. The law has a new purpose. Romans 8:2 calls this “the law of the spirit of life.” The law is now used as the means by which the believer shows love to God and to others. Yeah, I know, it’s that pesky cross chart again. Dwelling on sin leads to fear of condemnation because sin uses the law for that purpose. So when we dwell on sin, we are willingly empowering a Sin master from whom we were freed when we were born again. But this is exactly what protestant orthodoxy does; it keeps a believer under law and under constant fear of condemnation. Is it any wonder why “christians” constantly function like the unregenerate? A born again believer does not sin. Not only that, he CANNOT sin (1 John 3:9). Sin has to do with condemnation, and the believer is not condemned because there is no law to condemn him. Since there is no law to condemn, there is no sin! To the extent that he obeys the law or not is irrelevant. He is no longer condemned. His motivation is not one of seeking to merit righteousness. He already IS righteous. His motivation is a desire to express his love for God and others. At worst, he simply fails to show love as he should. It does not affect the reality of his righteous state as God’s child! The use of ambiguous language to conceal the truth or to avoid committing oneself; prevarication. Using an ambiguous term in more than one sense, thus making an argument misleading. Protestantism is a fraud because it plays upon the presumptions of the unsuspecting laity by allowing them to assume the normative definition of words while gradually indoctrinating them to a redefinition of terms. In this year’s TANC Conference, Paul Dohse gave a list of over 45 terms (and I think the list is up to 47 now and still growing) that Protestantism has redefined. This redefinition of terms is accomplished using various logical fallacies, the most seductive of which is equivocation. The Cleveland Browns are always looking for good players for their team. Yo-Yo Ma is an excellent cello player. 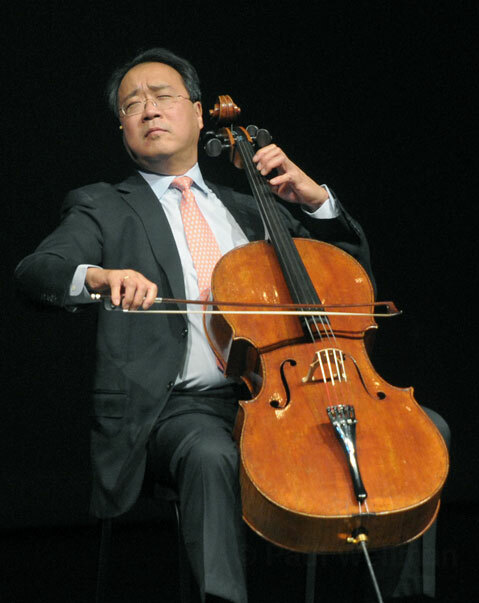 Therefore, the Cleveland Browns should try to get Yo-Yo Ma to play for them. I’m sure there are many in Cleveland who would say that the Browns couldn’t do much worse if they did sign Yo-Yo Ma to play for them. Now this may seem like a silly example, but the reason it seems silly is because the problem is obvious: it assumes a single definition of the word “player”. There is no regard given for context or perspective. In reality, the word “player” can have several meanings, and that meaning is defined by its usage. In the first statement the word “player” is used to describe someone who plays sports. We know this because the Cleveland Browns are a professional football team (of course one could argue if the Cleveland Brows actually play anything that resembles football). In the second statement the meaning of the word changes to describe someone who plays a musical instrument. Same word, but two different meanings. The fallacy of equivocation occurs in the concluding statement because a single definition is assumed. Context and usage define meaning. Anyone who is a Christian is a member of Christ’s church. Joe is a member of his local Protestant church. Therefore, Joe is a Christian because he a member of the church. This example is probably a little more confusing, but that is what makes it a better example of the use of equivocation. The obvious question one should ask is which “church” do you mean? The definition of the word “church” is made ambiguous because of the switching of context and usage. Are we talking about “church” being the Body of Christ or do we mean the local institutional place of assembling? Protestant pastors and elders want to have it both ways, and so their use of language is purposefully confusing. In one breath, they will declare that “the church is a body and not a building.” In the next breath they will suggest that if you are a Christian then you must be a member of a local church. Such a subtle conflicting of terms will eventually indoctrinate the laity to the underlying truth of what they really mean; that church membership equals salvation. While no one would consciously acknowledge that, such a reality works itself out in practice and behavior. If you really want to understand just how confused the Protestant laity is, then consider how your typical Protestant understands the meaning of the word sin. Man is saved from the penalty of death through “faith alone” in Jesus for the forgiveness of sin. Therefore, Christians still need forgiveness of sin. Protestantism sees the word “sin” and maintains a single definition of it throughout scripture. What are the implications of that? Since Christians still sin and need forgiveness, they are still under condemnation. Nothing really changes for the Christian. He is still the same as an unbeliever. 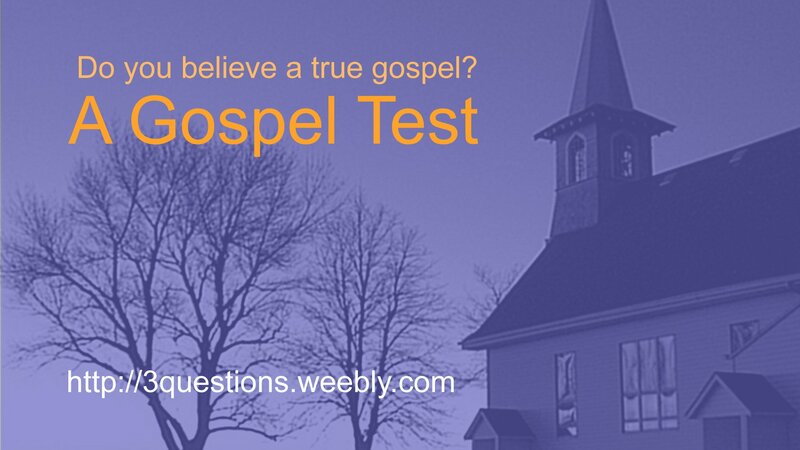 Christians’ lives are characterized by constant fear of condemnation and lack of assurance. It should also be noted that all of these definitions of sin may be applied to one who is unsaved. The world is full of unsaved people who understand the difference between right and wrong and can choose to act in accordance to their conscience. The world is full of unsaved people who know how to show love to another but from time to time will not do so. But the problem for the unsaved person is not because he fails to obey the law perfectly. The problem is that because he is under law, such transgressions bring condemnation. However, because Protestantism limits the meaning of sin to a single definition, sin can only be understood in the context of condemnation. Therefore, when the Protestant sees the word “sin” in the Bible with regard to the one who is saved, there can be only one conclusion, and that is that believers still need on-going forgiveness of sin because they are still under condemnation. Why is there no condemnation for the believer? Because when a person is born again, the law is ended for him. He is no longer “under law”. The old man who was under law dies and in his place is reborn a new creature who is the literal offspring of the Father. Paul understood that sin can only condemn where there is a law that condemns. Sin for the believer has a different meaning. 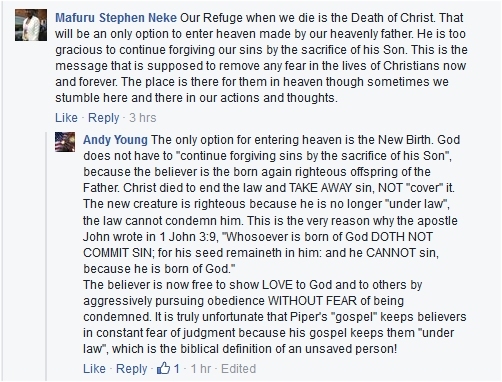 Notice that the first two definitions of sin no longer apply to the one who is Born Again. Because the believer is no longer under law, any definition of sin can no longer include any meaning that implies condemnation because there is no law that can be used to condemn him. Therefore, sin for the believer cannot be defined as a transgression of God’s Law (that law was ended). Neither can it be defined as falling short of God’s standard of perfection because the believer is righteous as a state of being as a result of the New Birth. However, because the new creature still resides in a body of flesh that is “weak” (not evil! ), the personification of Sin as an Entity still tries to tempt the believer and have control over him. Such temptation can still lead believers to violate their own sense of right and wrong (conscience). Believers may still be doubtful about the liberty they have to engage in behaviors that aren’t wrong in and of themselves. (Think of the example of meats offered to idols that Paul used in 1 Corinthians 8. Such a behavior would be a violation of conscience). Believers can, and often do, fail to show love to God and others as they ought to. Please notice – while the Bible might use the word “sin” to describe these behaviors, none of them bring condemnation to the believer!!! They might bring about Fatherly chastisement through the natural consequences of one’s actions, but Fatherly chastisement is not the same as condemnation. Fatherly chastisement does not alter or nullify one’s righteous state of being. This is because the law which condemns was ended! I have often stated that any time someone asks me if I sinned today that my usual response is “No.” But since we need to be sure there is no equivocation when it comes to understanding the word “sin”, perhaps we need to employ a new strategy. In fact, when talking about defining sin and the law, we can take this strategy one step further. You see, it is really the same law, but the same law has two functions. Which function depends on if you are “under law” or “under grace”. 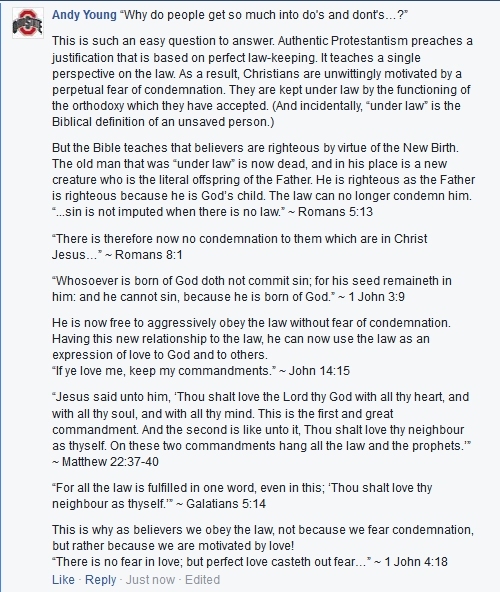 For the one “under law” – the unbeliever – it is the Law of Sin and Death which can only condemn. For the one “under grace” – the one who is born again – it is the Law of the Spirit of Life which cannot condemn and is a means to show love to God and others. Therefore, a failure to keep the Law of the Spirit of Life is not “sin” as defined by Protestantism. With a single perspective on sin and law, the equivocation of Protestantism keeps the laity perpetually confused, which only serves to foster continuous doubt and fear. The only way the laity is going to shake off this cloud of confusion is to start asking simple questions and reject the long-standing assumptions in which they find themselves entrenched.